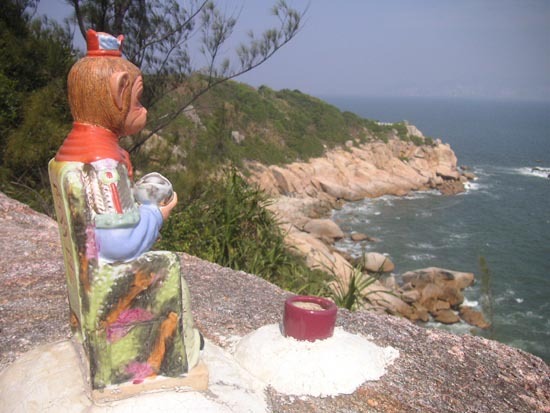 Southeast Cheung Chau boasts paths that wind around headlands and curl up and over hillsides, passing through woodland, and near to naturally sculpted giant boulders, once grand but now ruined houses, a couple of temples, a tiny nunnery, and cliffs dropping to the sea. The main trail here is rather fancifully named the Mini Great Wall, but you can find other less known yet still fascinating paths to explore. 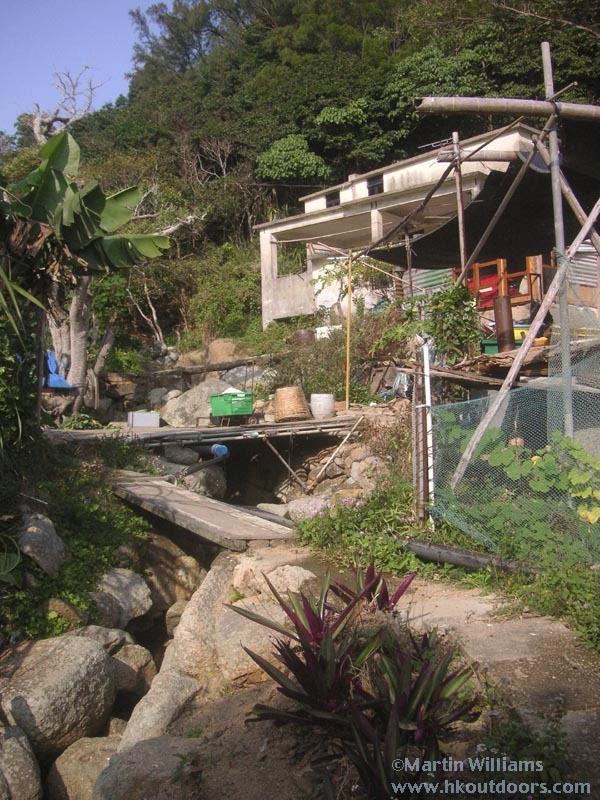 Perhaps the easiest route to the southeast is the path south from Tung Wan beach, to smaller Kwun Yam Wan. Just above Kwun Yam Wan is a small, garish red temple - and above this are a couple of trail junctions in a small valley (Fa Peng valley, to me). From one of these junctions, steps lead uphill - towards the Mini Great Wall. The path takes you to a pavilion atop a squat headland; there are top views across Cheung Chau and to Lantau en route and from this pavilion. From the pavilion, a path angles down to the left - though rather fancy looking, it only leads to a pavilion by the sea: a dead-end, albeit with good views across Tung Wan. The Mini Great Wall starts at the next flight of steps down to the left - and you'll find this isn't a wall, but an extravagant path of marble (or marble lookalike). The main path curls on round the hillside, with fine views including the great boulder known as Human Head Rock. From most angles, it doesn't look much like a head - just a two-storey high boulder perched on a narrow neck, but if you get up close and walk round to the northern side (best vantage now overgrown with thorny vegetation?) you'll see a face like profile, complete with nose and a hollow for an ear. Just above Human Head Rock, you can scramble up a rock to look back along the trail - this is perhaps the best vantage for appreciating why it's called the Mini Great Wall, winding along wild hillsides. On from here, the "wall" comes to a dead end on another headland, with cliffs below, views of steep hillsides plunging to the sea. On a rare, very clear day you can see islands in the Lema (or Wanshan) group, including Ling Ding to the south, Dangan Island to the east, as well as Lamma, Hong Kong Island and - to the north - Hei Ling Chau and a little of eastern Lantau. On a more typical, smoggy day you'll just have to imagine most of these islands! 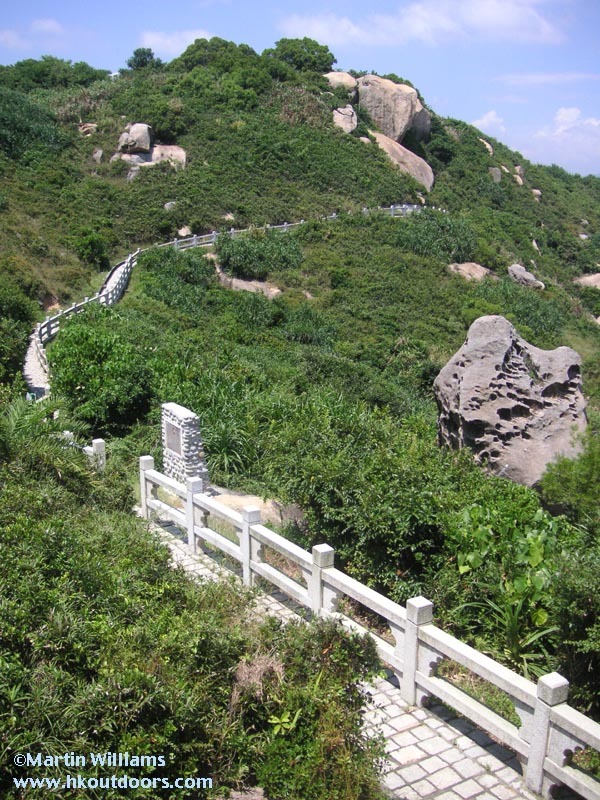 From near Human Head Rock, a flight of steps leads uphill, away from the Mini Great Wall. The trail zigzags - at one sharp corner, a faint trail tunnels through a bamboo thicket, to an abandoned house: a creepy place, I'm told. The steps end, the trail eases, and passes a pink apartment block. Here, there's a right turn - follow this, and you could turn right again, down a valley back to Kwun Yam Wan. Straight on, the path follows the coastline, There's a right turn, at another small headland. Here, a rough track leads down through scrub, towards the "Lovers' Cave". This isn't really a cave - but a space below and between huge boulders. Though the name suggests it's a romantic spot, small concrete walls suggest this was also used as a wartime pillbox. There's another trail on top of the headland - past a broken down fence where until recently an ageing sign gave the address as 11 Peak Road. The sides of the path are overgrown; but you'll soon come to an old house built on two levels - the highest being on high rocks. This was perhaps one of the places missionaries used to stay in, between stints working in China. Look among the trees, and you'll see a small statue of the Virgin Mary. You can look around the buildings - which once must have commanded splendid views over the South China Sea: a marvellous spot for taking tiffin on the verandah. But now the area is overgrown. A path leads on down the headland, to another building, its surroundings so overgrown there's no view at all from here. Back to the main trail, continue and you'll arrive at another junction, with Fa Peng Valley on the right (Kwun Yam Wan is below here). There's also a new building to the right - for school parties? - and a walled compound with houses on the right: the latter is usually utterly quiet, too far from the pier for people to live here full time. Turn left, and there's a path back to the coast; another old and partly ruined house is on the right. Again, it was surely a fine place in its heyday. You can keep to the coastline, skirting round another headland where a collection of small apartment blocks - Seascape Peninsula - stands where there was another old house, that for long was in ruins (known to expats on Cheung Chau as "the Rockies": see Holiday Villas thread in forum here). Here, too, few people have moved in: the location is splendid, yet too remote for most people. Onwards, the path passes a place where Christians come for some peace. There's a trail junction: right leads through woods to another junction, where a left turn takes you to Kwun Yam Wan, a right turn to the Sports Ground, and Peak Road. Left is a short trail down to Nam Tan Wan. There's a small valley with vegetable plots here: nowadays, perhaps, mainly worked by a few people who are dedicated to organic farming. There's also a temple, with a courtyard above the rocky shore. 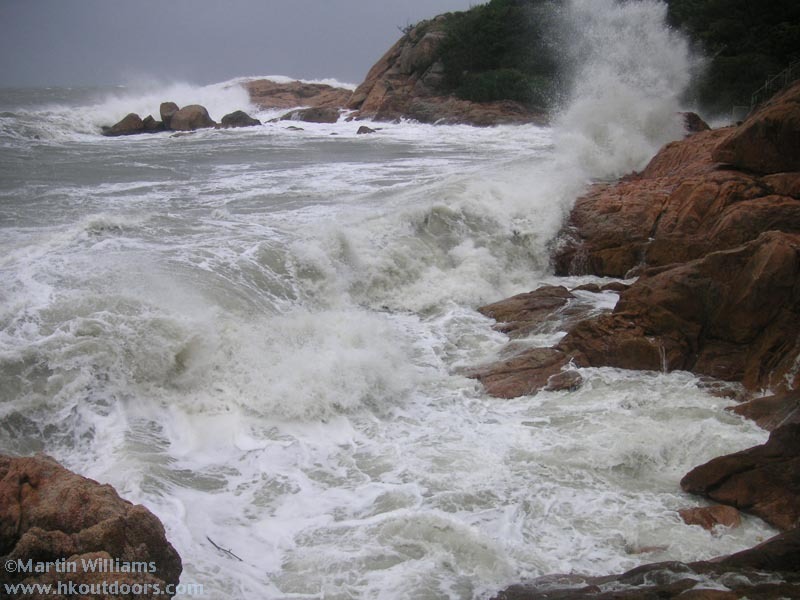 This is a fine spot for enjoying the coastal scenery - and for savouring the thrills of tropical storms passing close by Hong Kong, creating waves that pound the rocks, and send spray flying, mingling with the driving rain (take care that no monster wave arrives and washes you out to sea!). 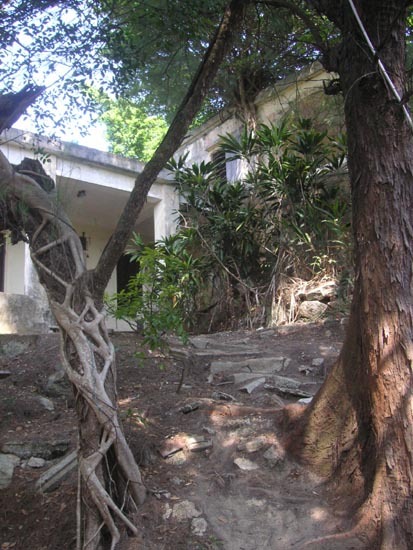 There are also places to explore in the interior of southeast Cheung Chau. There's a path up the southern side of Fa Peng valley: on the left side as you walk up. Turn right at the top, to pass through a wood with a large rubber tree near the path, and right again at another junction (ignoring the coastal routes), and you'll reach yet another trail junction - this southeastern corner of the island may be small, but the trails are convoluted! On the left here is another ruined house that was formerly - I believe - a holiday home for missionaries. Again, it's interesting to look around, and perhaps imagine past days when people maybe relaxed on the verandah - gin in tonic in hand? Just past this ruin (trail to the left), there's a still occupied building on the left: a nunnery I think, tho I'm yet to see more than one or two people here. On the right, another of the old (missionary) houses is perched near the top of Fa Peng Knoll, in grounds complete with a small pavilion by a Chinese style bridge across a tiny ornamental pond. It's sadly dilapidated. From here, the path runs down through woods, and past buildings that are still much in use, and reaches a junction where a right turn leads back to Kwun Yam Wan, a left turn to the Sports Ground and Peak Road.